A refereed journal that welcomes manuscripts in the broad area of applied linguistics, with a strong preference for contributions relating to language acquisition (second language acquisition, foreign/second language teaching, including computer-assisted learning) and educational linguistics. The journal publishes reports of empirical studies and ground-breaking theoretical articles. Each issue also includes book reviews. The journal is published twice a year by the Department of Linguistics at the K.U.Leuven, the Department of Applied Linguistics of the VLEKHO (Brussels) and the Department of Applied Linguistics of the Lessius Hogeschool (Antwerp). The name 'ITL' refers to the center of applied linguistics at the K.U.Leuven where the journal was originally founded (Instituut voor Toegepaste Linguïstiek). This journal has recently merged with «Interface, Journal of Applied Linguistics», formerly published by the Department of Applied Linguistics (VLEKHO, Brussels), and now takes the new name 'ITL International Journal of Applied Linguistics'. ITL - International Journal of Applied Linguistics is abstracted and indexed in Bibliographie linguistique/Linguistic Bibliography; Scopus; INIST/CNRS; CrossRef. 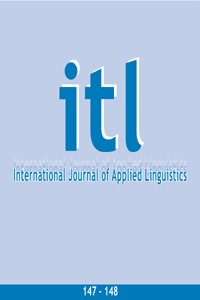 ITL- International Journal of Applied Linguistics is a peer-reviewed journal.